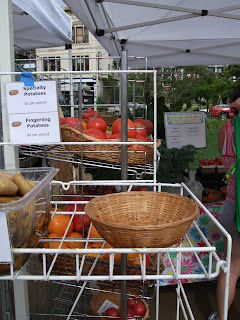 This week I am featuring Running Creek Farm at the Northside Farmers Market. Running Creek has one of the most attractive booths and extensive selections of fresh, locally grown foods you can find at any metro-area market. Co-owner Jim Lowenburg told me he grows about 14 varieties of potato and 20 types of tomatoes. Yesterday, the booth had a good selection of each along with five types of garlic. If you haven't had fresh-picked, local garlic but only know the supermarket stuff, do yourself a favor and find a market that sells the former. It will be a revelation! As you can see from the photo, there's also a pretty display of cut flowers for sale here. Running Creek Farm is in Mt. Healthy, OH, and all their produce is pesticide-free. Northside Market at Hoffner Park (off Hamilton) is open Wednesdays from 4 - 7:30 PM. 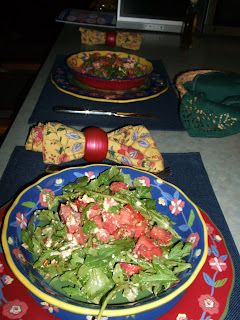 Here is a favorite summer dish--best in summer primarily because you can get fresh okra. Don't say "yech" to okra! I know it can be slimy and awful, but if you cook it properly (see technique below, step 1), it is surprisingly pleasing to the palate. Summer also is a great time to make gumbo because farm-fresh tomatoes, peppers and onions enhance its aromatic flavors. Serve over rice, and add plenty of hot sauce, to your taste! This meal is based on three delicious cheeses purchased at Findlay Market last Saturday. The cheeses, at the top of the photo and starting with the one nearest the camera, are Humbolt Fog (a goat cheese with two textures--creamy on the exterior and crumbly in the middle); behind it is a Brie with walnuts; to the left of that is one of my favorite blue cheeses, because it is less salty than most, the hard-to-find Ferme d'Ambert. We had only a quarter-pound of each, and some leftover at the end of the meal. This is indulgent, full-fat stuff, so healthy foodies should eat these in careful moderation. But they are so, so yummy! To go with the cheeses, I laid out chunks of the freshest tomatoes (with high quality balsamic vinegar for drizzling), dried and fresh fruits including cherries, golden kiwi and dried figs, candied walnuts, truffled honey (a treat brought back from Italy) to drizzle on the cheese, thick slices of whole-grain bread (not pictured), and in the foreground, the one hot dish of the meal. It's Swiss chard sauteed with onion, mushrooms and a little red bell pepper. To drink, I put out Riesling and dry, Amontillado sherry. This was a terrific repast! The documentary about the American industrial food system, "Food, Inc.," is still playing at the Esquire Theatre in Cincinnati. See it, if you possibly can. First and foremost, the movie suggests that we "vote three times a day" for healthier food, meaning we can change the system, if incrimentally, when we select the foods we put on our tables and in our mouths at every meal. Selecting healthy, wholesome, safe food means (for instance) buying at farmers' markets and other sources of fresh, locally or regionally grown, organic (when possible) foods. Read labels and don't buy stuff with a long list of chemical ingredients and/or high fructose corn syrup and/or trans fats. Avoid supermarket and fast-food sources of meat and poultry. Shift to a more plant-based diet--I don't think the movie actually advised that, due to the long arm of the meat lobby's lawyers, but reading between the lines, I find that message comes through pretty clearly. In fact, my strongest reaction to watching "Food, Inc." was a desire to make and eat more vegetarian meals than we already do. But since meat is tasty and not always easy to do without, note that farmers' markets often include vendors from regional farms who raise grass-fed cattle and free-range poultry, which can be part of any healthy foodie's diet. The two markets I frequent--Findlay and Northside--do have those foods. You can also search the Internet for places to buy non-industrial meats and eggs. Summer and fall are easy times to eat a "locavore" diet. The real challenges come when the growing season ends. Stay tuned later in the year for winter strategies for healthy foodies. Here's a simple salad from the bounty of summer, with a one or two exotic ingredients thrown in. The dishes are from a stop at one of my favorite road finds: Bloomfield's, a wonderful tableware and all things houseware in Flat Rock, NC, on I-26 between Asheville NC and Greenville SC. Discount prices on Fiesta ware, Italian crockery, and an amazing array of cookware, gadgets, grilling utensils, glassware, tablecloths, and too many other things to name. Just back from 6 days in western North Carolina, a family-oriented, working trip with few culinary highlights. But we did get to stop--going and coming--in Asheville. Among its many charms, the mountain town is blessed with plenty of good restaurants. 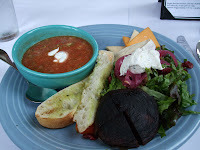 My go-to fave is the vegetarian Laughing Seed, where we had lunch on the way to our destination (Rutherfordton, NC). 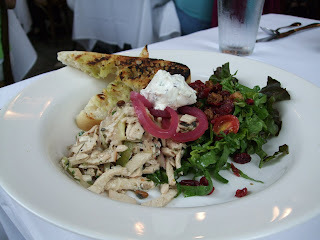 On the way home, we met my step-brother for lunch at the Corner Kitchen in Biltmore Village. The photo at left is of a lavendar-infused chicken salad that my mom had; the smaller photo (right) is my "ploughman's lunch," the best part of which was the cup of gazpacho. That black blob on the plate is a grilled portobello mushroom. For most of this week (7/20), I am on the road in North Carolina. Regular blogging will resume by week's end! The Northside Farmers Market used to be crammed into a small parking lot on Hamilton Avenue across from Melt and the Northside Tavern. Parking was impossible and it was hot and full of car fumes there. This year, however, the market has moved to Hoffner Park, which is just off Hamilton Ave. (take a left on Hoffner St.) as you enter Northside from Clifton. The location is a huge improvement. Vendors now are comfortably spread out, there are benches and even shady spots where you can relax while you shop, and many more vendors usually come to this great location. The offerings are likely to expand even more as the growing season hits its full stride in the next few weeks. 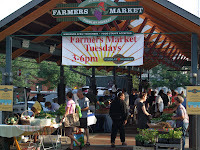 The market is every Wednesday from 4 - 7:30 PM. "Healthy eating needn't be costly"
This is the headline from an Associated Press story in today's local paper. The article notes that in these hard economic times, many people think it is more frugal to eat cheap fast food than more expensive fresh fruits, veggies and seafood. But the writer points out that there are many ways to eat healthfully on a lower budget. Some of the less expensive but healthful foods mentioned: eggs, spinach, milk, apples, carrots, canned or frozen corn, canned tomatoes, chicken, potatoes and lean hamburger. I would add canned tuna and brown rice, right off the top of my head. Fast food may be convenient and cheap, but most of it is a nutritional zero--not good for you or your kids! And in the middle of summer, fresh veggies and some fruits are widely available and less expensive than at any other time of year. 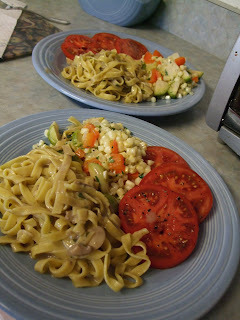 Fettuccini tossed with a simple mushroom sauce. My husband also had some multi-grain bread with olive oil. Healthy, vegetarian, locavore, filling and YUMMY. Hooray for summer!! The Healthy Foodies love cauliflower! While it can be boring all by itself, cauliflower’s versatility and nutty texture--when cooked properly—make it a staple in our kitchen. Along with broccoli and cabbage, it is one of the most healthful veggies in the market, and you can get it year-round. Local farmers may have some at their stands right now, in July. Here are a couple of tasty recipes with cauliflower as a star ingredient—one with an Italian accent, the other featuring Indian flavors. You can substitute the broccoli/cauliflower hybrid “broco-flower,” if you like. Note: You can omit the anchovies if you prefer, but the ingredient does add depth to the dish. Soak currants in wine for about 15 minutes and set aside. Heat a large skillet and add olive oil. Add anchovies and cook over high heat for about 1 minute, mashing them with a wooden spoon. Add cauliflower and cook until it begins to brown. Add pine nuts, currents in the wine and crushed red pepper. Reduce heat to medium and simmer until the liquid evaporates, about 5 minutes. Stir in cooked pasta, water and half of the grated cheese. When dish is heated through, adjust seasonings and add salt and pepper to taste, then transfer to a large serving bowl, sprinkle with toasted bread crumbs and the rest of the cheese. Serve immediately. Note: Make this a mild dish or a spicy one depending on the type of curry powder you use. Heat oil in large, deep skillet over medium-high heat. (Use cooking spray to coat bottom of pan with a thin film of oil, if needed.) Add onion, garlic, carrots and celery and cook, stirring, until vegetables start to become tender, about 3 minutes. Stir in curry powder and blend well into vegetables. Add tomatoes, water, chick peas, chutney and cauliflower and cook, stirring, until mixture is well blended. Cover, reduce heat to medium and cook for 5 minutes or until dish is heated through. Uncover, add half and half or coconut milk. Transfer to a serving bowl, sprinkle with slivered almonds and serve over rice (white or brown). The peak of summer's growing season has arrived, so make time in your schedule for visits to farm stands or farm markets for some of the best food you can buy. Here's a shot of Findlay Market, downtown, taken yesterday morning. I go every Saturday unless we are out of town, and I go early--mostly to avoid the parking lot chaos of later in the day. My husband likes it at noontime, where he eats lunch, talks with the many people he knows who also make Findlay a Saturday lunch destination, and partakes of the wine tasting at Market Wines (a mere $3 for 4 wines). 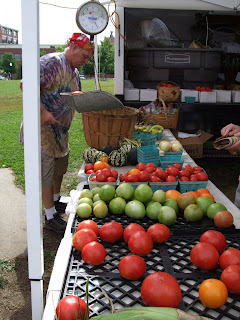 This time of year, my interest is a cook's interest: great, ultra-fresh, locally grown or produced food. You haven't tasted tomato, or corn, until you try these veggies from a nearby farmer. Also at the market: Blue Oven Breads, artisan loaves in about 10 different varieties; locally produced, grass-fed bison meat, chickens and their eggs, pork and lamb; fresh baked goods ranging from rustic fruit tarts to coffee cakes, full size pies, cookies of all kinds....and lots more. 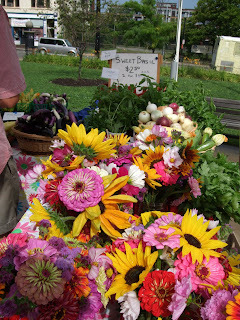 If downtown Cincinnati is not your scene, I'm sure there are farm-fresh products available closer to your home. Seek them out! 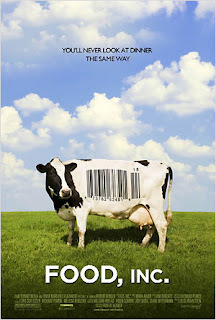 Food, Inc. is at the Esquire 1:30, 3:30, 5:30, 7:30 and 9:30. I hope to see it this coming week, if at all possible (not possible this weekend due to other commitments). We have bigger-breasted chickens, the perfect pork chop, herbicide-resistant soybean seeds, even tomatoes that won't go bad, but we also have new strains of E. coli—the harmful bacteria that causes illness for an estimated 73,000 Americans annually. We are riddled with widespread obesity, particularly among children, and an epidemic level of diabetes among adults. Anyone who gets the chance to see the movie, please post your thoughts! Had lunch today at a new (since March), organic, vegan restaurant called Loving Cafe. Owned and operated by a group of about a dozen metro Cincinnati foodies, it's on Montgomery Road in Pleasant Ridge. While some of the offerings might be strange to most people--the green tea with "popcorn undertones" was a little weird even to this lifelong tea drinker--my friend and I were impressed with our lunch. I had a panini, basically a crunchy grilled sandwich, filled with vegan versions of turkey, cheese and mayo, along with some crunchy coleslaw and banana peppers, and maybe a little too much mustard. Overall though it was a large and satisfying sandie. My friend had a vegan sloppy joe, which I didn't taste but she said was very flavorful, even though "you would not mistake it for meat." We split a piece of "raw blueberry pie," which we both loved. The filling was fresh blueberries lightly sweetened and mashed into a kind of paste; the crust was flourless, made from crushed pine nuts, cashews and chopped dates. Really yummy! They're open Tuesday - Saturday from 11 to 8, but closed between 2 and 4. The manager told me that they've gotten a lot of great support from the neighborhood, and that more and more people from all around Cincinnati have found them. I'll be writing an article for the Enquirer about this resto for the "Under $25" column, probably to run on 7/17. What might be best about this place is that it is totally sat-fat and cholesterol free, so anyone with health concerns (heart, diabetes, blood pressure, etc.) can basically eat anything on the menu. They have lots of good-looking desserts--all vegan--including several with everyone's favorite ingredient, chocolate. Check it out, healthy foodies! Beginning on Friday July 10th, the documentary "Food, Inc." starts its run at the Esquire Theatre in Clifton. Anyone who cares about the health/nutrition/safety of the food his or her family eats should be SURE to see this film. A blog for food lovers -- who also are health nuts! Along with my friend, Dr. Mary Ann Barnes, I have been writing a column under the pen-name Healthy Foodie for Whole Living Journal (a Cincinnati based, bi-monthly magazine) since 2003. Mary Ann and I also have a website, www.healthyfoodie.com. We both believe that you can live a life that's dedicated to pleasure and also to health--at the same time. We love to cook, eat, travel, drink wine, garden and spend as much time outdoors as possible. Mary Ann stays trim in part through her devotion to vegetarian eating. I'm not vegetarian, but I am a dedicated gym-rat and have been for many years. 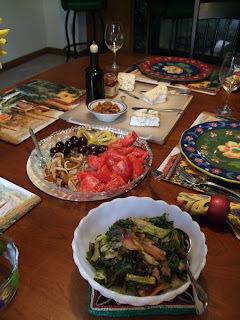 My favorite cuisine comes from southern France and central Italy--the food of Provence, Nice and Tuscany. After visits to this part of the world, I've tried to duplicate some of the flavors I've enjoyed there. My favorite foods from that region -- and favorites overall -- include fennel, arugula, saffron, tomatoes, bean soups and stews, tuna and of course pasta and olive oil. Please post your own recipes, healthy eating tips, travel stories and whatever else you would like to on this site.